Camp Hours: 9:30AM-4 PM Monday – Friday. Early Drop off (8:30am) and Later pick up (5pm) can be arranged at a rate of $15 per hour. Fashion Illustration & Branding: This class is the perfect way to end the day in our bright and sunny art studio. Students will learn from a professional Fashion Illustrator how to sketch the croquis, render fabric and use paint, fashion markers and more to bring their design to paper. 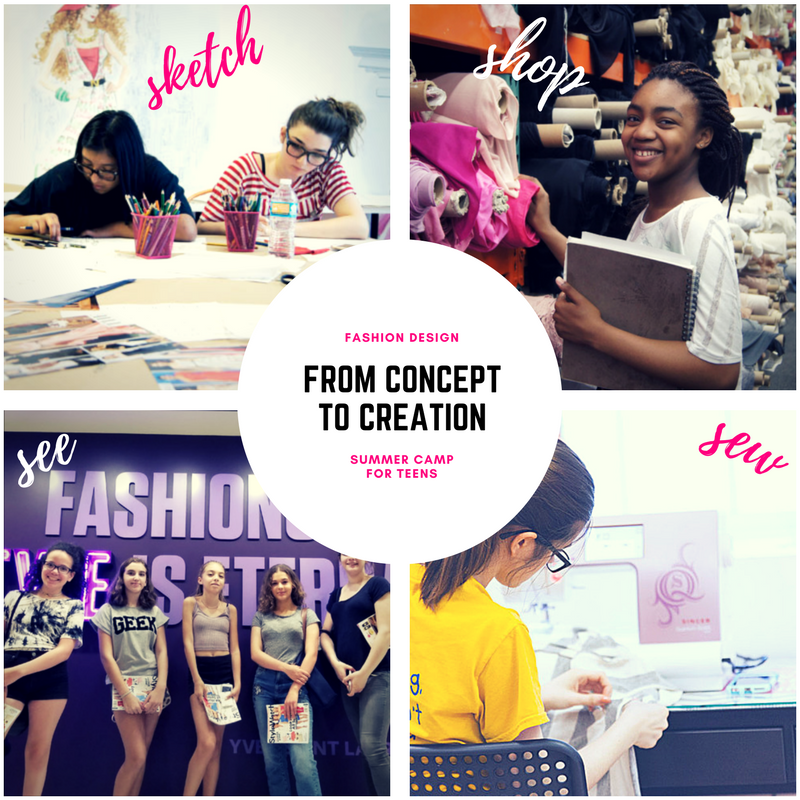 Perfect for those looking to apply to a fashion design college program! Lunch: We have a refrigerator, microwave and water cooler in our studio. We may also take lunch outdoors (as a group) weather permitting. Lunch is not included in the camp fee and we ask that campers pack a peanut free lunch. Sewing: In our sewing class students will learn to use the sewing machine to create garments of their choosing with fabric purchased earlier in the week. We encourage students to make three items in one week. Our studio also has serger machines, dress forms and steam irons as well as all sewing supplies. Field Trips/Guests & Activities: Our campers will go on a wide range of field trips. Day one will be dedicated shopping for supplies at Mood Designer Fabrics (Included in camp fee). The rest of the week will include one fashion exhibit (Met Museum or FIT Museum), one exclusive trip to a fashion business or showroom (past trips have included: Marie Claire Magazine, Marchesa Showroom, Calvin Klein, Austin Scarlett, Tory Burch etc) and two guest speakers (we’ve had stylists, authors, bloggers, buyers, editors and fashion designers all come to speak to the campers). All supplies, trip transportation and fees are included in this fee. Early drop off (8:30am) and Late Pickup (5pm) available for $25 per hour. Please note lunch is not included in the camp fee. Save 10% with early registration; use code earlycamper19 at checkout, now through March 15th 2019! We offer a Sibling discount of 10% off of the second child’s registration – please note this when registering or call.